Your style is “reportage wedding photography”. What does it mean? It means that I don’t like posed shots. I try to catch the most precious impromptu moments because I believe that emotion and beauty lie in a gaze, a caress, a blush. Will you personally shoot at our wedding or will you send a collaborator? I will personally attend your wedding. Even if backed up by an assistant (when included in the contract), I will be the one responsible for capturing the main moments of your wedding. Will you be working alone or with an assistant? It’s up to you. 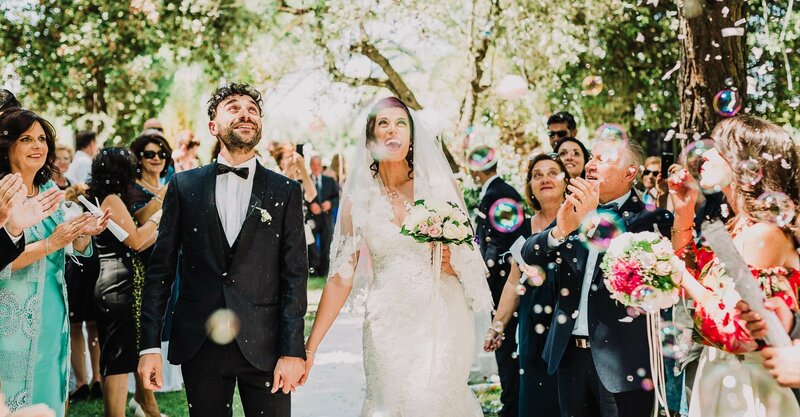 Having a second shooter guarantees a greater number of shots from different perspectives, thus enriching considerably the wedding photo shooting. In this case, you will be charged an assistant fee. Nevertheless, I can provide different packages for every need. Will you choose to have one photographer or two, either case the passion and the enthusiasm that I put in my work won’t let you down! Will you be there until the cut of the cake or the end of the celebration? This is also up to you. We can agree upon the wedding coverage together: I am ready to capture the key moments of your wedding with the same attention to detail, discretion and creativity. I’ve read that you live in Apulia, are you willing to travel? Absolutely: I love travelling, both in Italy and abroad! Do you charge additional fees for travelling? Yes. Additional fees (travel, food and accommodation) will be calculated and clearly stated in the final estimate. You will receive between 600 and 800 edited photographs, on a USB flash drive. Will the pictures be in high resolution? Is it possible to receive the pictures in a wedding album? Sure. You can receive your photos in a splendid fine art album! Is it possible to see the album before sending it to print? Yes, absolutely. I will provide you with a soft proof of your album that will help you understand how the final design will look like. What is the cost of shooting a wedding? Contact me: you will receive a detailed estimate with information on packaging, albums, and other details. Before confirming you as our wedding photographer, can we meet? Of course, I will be pleased to offer you a coffee! In case it isn’t possible to meet in person, we can arrange a Skype call. How can we confirm you as our wedding photographer? In order to book you will be required to sign a contract and to pay a previously agreed deposit. These operations (that you can easily carry out online) will confirm your wedding date. Please feel free to contact me for any further information!